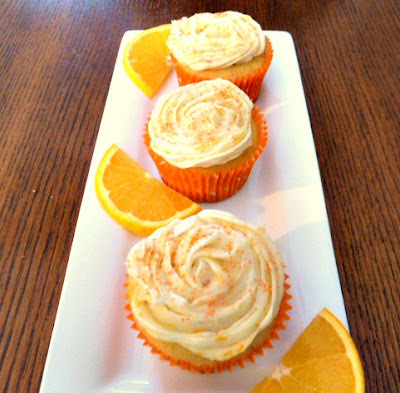 Baking and Cooking, A Tale of Two Loves: Orange Orange Cupcakes for the Orange Bowl. My Alma Mater, Northern Illinois University, Fighting Huskies football team from DeKalb IL went to the Orange Bowl to play against The Florida State Seminoles, Tuesday night. Everyone here is so excited and proud , because the team was the underdog, but they have a wonderful quarterback, Jordan Lynch. Even though the Huskies lost 31-10, they put up a fight and showed America, that they could compete on the "big stage." It's too bad that my Dad wasn't here get to see the game. He was a big Huskie Fan, and went to many football and basketball games in his lifetime. I'm sure though that he was watching the game and cheering from Heaven. To commemorate the Orange Bowl game, I made Orange Orange Cupcakes. Orange Orange Cupcakes are bursting with tons of orange flavor with orange extract, orange zest, and orange juice in the batter. Then, these fragrant beauties are topped with a creamy Orange Butter Cream Frosting loaded with lots of orange zest, and sprinkled with colored sugar to make them even more festive! These cupcakes taste like you are eating an orange, with all of those orange flavors hitting your senses. So good! If you have extra oranges that you don't know what to do with, just make Orange Orange Cupcakes, and you won't be disappointed. Enjoy! 1. Preheat oven to 350 degrees F (177 degrees C) line 12 muffin cups with paper liners. 2. Place the sugar and orange zest into the bowl of your mixer and blend until moist and fragrant. Add in butter and beat until light and fluffy. Add the eggs, one at a time, beating well after each addition. Beat in the vanilla and orange extracts. 3. With the mixer on low speed, alternately add the flour mixture and orange juice, in three additions, beginning and ending with the flour. Scrape down the sides of the bowl. 4. Evenly fill the muffin cups with the batter and bake for about 18-20 minutes or until nicely browned and a toothpick inserted into a cupcake comes out clean. Remove from oven and place on a wire rack to cool. Once the cupcakes have completely cooled, frost with icing. Cream butter with an electric mixer, until light and fluffy. Gradually add in powdered sugar and vanilla, zest, and mix well, Add juice until desired consistency. Pipe or frost cupcakes. Sprinkle with colored sugar. Oh these are just lovely and sound delicious! 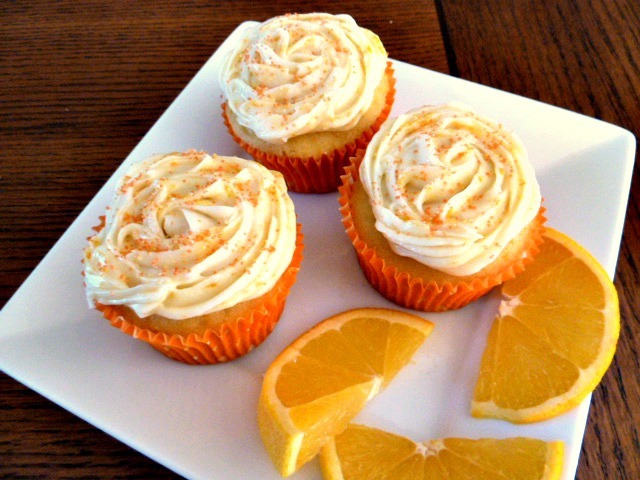 These cupcakes are very good with all of the citrus flavor. 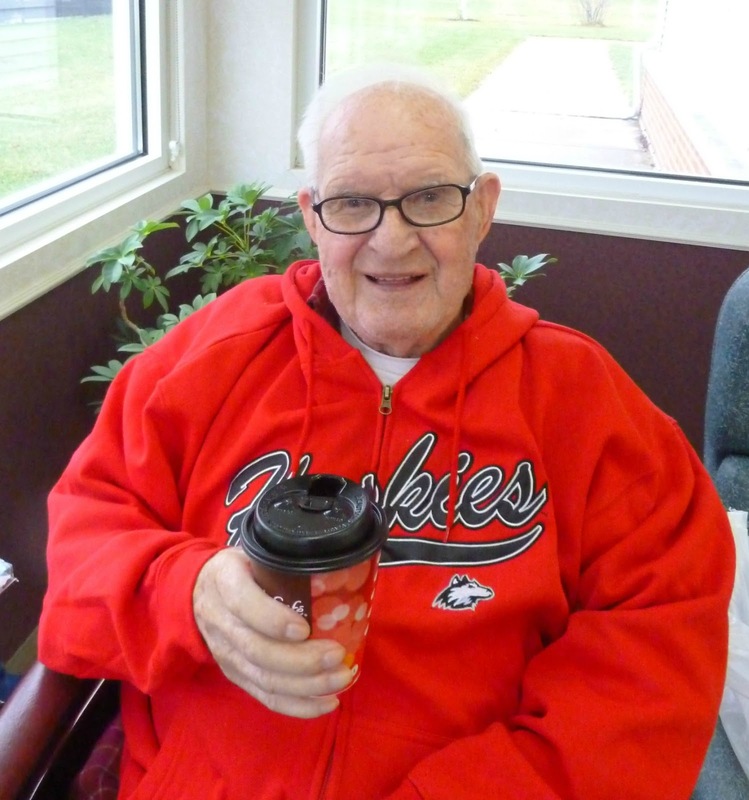 I'm sure you Dad is cheering on the Huskies from up above. I'm cheering for these orange cupcakes, oranges take the number 2 spot (behind lemons of course, lol) in my favorite citrus line-up. Happy New Years Becky!!! I have the same citrus lineup, too. You are so lucky to have a Meyer Lemon tree:) Happy New Year, too. They look so good! I am still planning to make orange cupcakes :) Thanks, for the recipe! My pleasure to share this yummy recipe. If you make the cupcakes, send me a picture. I caught this on RecipeNewZ and since I love all things Orange - making marmalade this weekend - couldn't resist these cupcakes and I'll be making them with the leftover orange juice! Thanks for a great recipe!! I don't think that I had ever mase orange cupcakes, but these are soo good. Becky, those look wonderful! I don't know one football team from another, but I'd throw an Orange Bowl party just to serve those cupcakes! These cupcakes are woth throwing a party to make. Lots of orange flavor. I was rooting for the Huskies along with you and your dad from Heaven... Your cupcakes were the perfect Orange Bowl treat!